A panel of five judges will decide who wins the News Report contribution at the Prix Bohemia Radio awards. The panel of judges will be made up of professionals with experience from the radio scene both at home and abroad. One of the judges on the professional News Report panel will be Andrzej Brzoska. Sound director, whose career has been linked with Radio Poland since 1979, was awarded the title of Doctor of Performing Arts with a specialisation in sound directing. Between 1994 and 2009 he was Deputy Head of the Polish Radio Theatre. On many occasions his recordings have represented Polish Radio at various international festivals: Prix Italia, Prix Europe, Prix Marulić and others. He won the Grand Prix at the Prix Marulić festival in Hvar in 2002 and has also been given awards at the Prix Italia Festival and at Dwa Teatry in Sopot. His radio play Andy was honoured with an award for the best European play of 2013 at the Prix Europa international festival in Berlin. He lectures at the Fryderyk Chopin University of Music and at the Aleksander Zelwerowicz National Academy of Dramatic Arts in Warsaw. In 2011 he was awarded the AES Fellowship Award for continuous excellence in audio production and for his achievements in the area of audio technologies. In 2016 he founded the radio station Radio Voice of Children at the Educational Institute for Blind Children in Kibeho, Rwanda. His recording Christmas Time get a prestige label Platinum CD of the year 2018. The second judge is to be David Vaughan, a writer, publicist and radio editor living in Prague. His documentary novel Hear My Voice won the 2015 Czech Book readers’ prize. The English version has just been published in London. David Vaughan has made award-winning radio documentaries for the BBC and Czech Radio on a wide variety of subjects. He teaches journalism and lectures on media history at several Prague universities. His book Battle for the Airwaves (2008) looks at the central role of radio in the Munich Crisis of 1938. For eight years he was editor-in-chief of Radio Prague, the international service of Czech Radio, and prior to that he was the BBC correspondent in Prague. 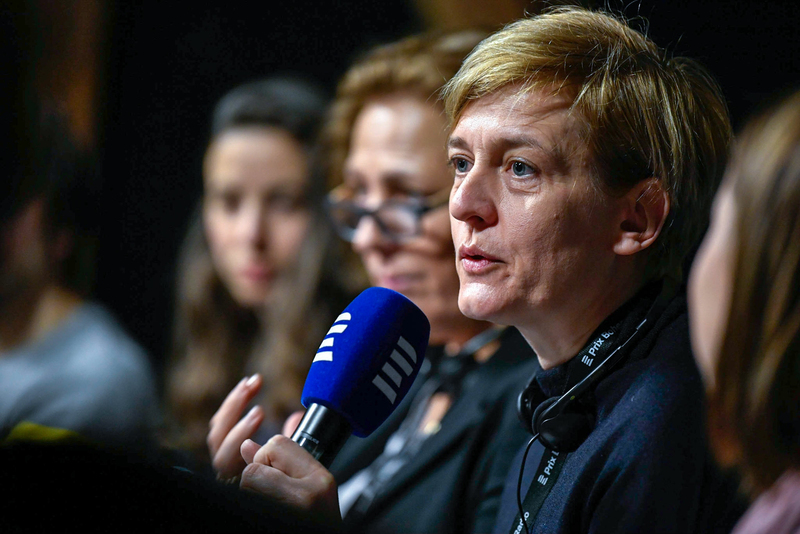 The third panel judge will be Emily Thompson, who produces Free Europe's Lady Liberty project, presenting works by women journalists and women's issues within the sphere of Free Europe broadcasting. She hosts the podcast Heard It From Her, a conversation with a woman in media with a story to tell. Prior to joining RFE/RL in 2013, she worked as a freelance contributor for several international media outlets, including Public Radio International and GlobalPost. Before that she worked as a writer and editor for The Prague Post and several other regional publications focused on Central Europe. She has a MA in philology from Masaryk University in the Czech Republic and a BA in English and French literature from Kansas State University in the United States. She is a native English speaker and is fluent in Czech and French. Peter Lange, the panel's fourth judge, studied opinion journalism, political studies and modern history at the Free University of Berlin. Since 1983 he has worked as editor at the radio station Rias Berlin and Deutschlandradio Berlin. In 1995 he transferred to the Cologne station Deutschlandfunk as editor-in-chief. He then worked as newsreader for Zeitfunk, head of department at Aktuelles and editor-in-chief at Deutschlandradio Kultur in Berlin from 2007 to 2016. In 2016 he relocated to Prague, where he works as foreign correspondent for ARD and Deutschlandradio for the Czech Republic and Slovakia. The last judge on the festival's panel is former Czech Radio foreign correspondent, Petr Vavrouška. He operated in areas of crisis such as Afghanistan, Pakistan and Macedonia. As a reporter he attended two winter Olympic Games and reported from the Mount Everest base camp. As a foreign reporter he worked in Russia, Poland, Baltics, Belarus and Slovakia. He received many prizes for his work in Czech Radio. He received the Novinářská křepelka award as well as being a two time laureate of the Journalism Award. He also received the Prix Bohemia Radio International Award in 2008. He wrote two books Ruská duše (Russian Soul) and Polská duše (Polish soul). Today, Vavrouška works as business director of mmcité+.